What is happening to Brussels’ inner-city neighbourhoods? The accessibility of housing to low-income households in downtown Brussels has become much more complicated over the last decade. At the same time, there have been many clear signs of renewed investment in these neighbourhoods. This article proposes an interpretation of these ongoing changes in Brussels in terms of gentrification. The analysis is rooted in particular in a study of migratory statistics, that is to say, who is leaving the Brussels neighbourhoods that are becoming gentrified and where are they going (remaining in Brussels or leaving the city altogether)? Results indicate that, even if gentrification in Brussels is still marked by the gradual mutation of working-class areas into “trendy” rather than “chic” neighbourhoods, this process is already highly selective in social terms. Indeed, whilst various types of migrant are leaving the inner city, their destinations vary markedly, in line with their socio-economic profiles. Au cours de la dernière décennie, l’accès au logement des ménages à faibles revenus dans les quartiers centraux de Bruxelles s’est sensiblement compliqué. Dans le même temps, de multiples signes de réinvestissement y devenaient clairement perceptibles. Cet article propose une interprétation de ces transformations actuellement en cours à Bruxelles en termes de gentrification. L’analyse repose en particulier sur l’étude de données migratoires : qui quitte les quartiers bruxellois en voie de gentrification, et pour aller où (à Bruxelles et en dehors) ? Les résultats obtenus indiquent que, même si la gentrification à Bruxelles traduit (encore) l’émergence de quartiers plus « branchés » que « chics », cette dynamique est (déjà) très sélective socialement. En effet, différents types de migrants quittent les quartiers centraux, mais les lieux de destination de ces mouvements de populations diffèrent nettement selon le profil social de ces migrants. De toegang tot de woonmarkt in de centrumwijken van Brussel voor gezinnen met beperkt inkomen werd het voorbije decennium aanzienlijk moeilijker. Tezelfdertijd vielen verschillende tekenen van vernieuwde investeringen er duidelijk op. Dit artikel interpreteert de transformaties die Brussel momenteel ondergaat aan de hand van het model van de “gentrificatie”. De analyse vertrekt met name van de studie van migratiedata: wie verlaat de Brusselse wijken gekenmerkt door gentrificatie en waarheen trekken deze migranten (zowel op het Brusselse grondgebied als erbuiten)? En hoewel de gentrificatie in Brussel zich (voorlopig nog) veeleer vertaalt in de opkomst van wijken die “in trek” dan wel wijken die “chic” zijn, wordt het proces toch (al) gekenmerkt door verregaande sociale selectiviteit. Verschillende types migranten verlaten inderdaad de centrumwijken, maar de bestemming van deze migratiestromen verschilt uitdrukkelijk naargelang het sociale profiel van de betrokkenen. I. Gentrification in Brussels: A limited development? II. Who is emigrating from the Brussels neighbourhoods undergoing gentrification, and where are they going? III. Gentrification and urban policies: a problem or a solution? 1Saying that there is a housing crisis in Brussels has become a commonplace. This situation’s high profile in the news and politics is doubtless linked to the fact that henceforward households’ lack of financial resources to cover their housing costs is no longer deemed to be problematic for those at the bottom of the social scale, but for middle-class households as well (see, for example, Le Soir, 22 August 2006a). So, according to the Rent Observatory’s latest survey in the Brussels-Capital Region (De Coninck and De Keersmaecker, 2004), households in the median income distribution category (5th decile*) now have access to only 21% of the Brussels rental market compared with 38% in the early 1990s. What then can one say about the Brussels households in the first three deciles of this breakdown, i.e., the poorest 30% of the city’s residents? Their access to the private rental market has fallen threefold, to a mere 4%, in a little more than a decade! This access is based on an arbitrary upper limit of 25% of the household’s income going for housing costs. Unfortunately, this cut-off is purely theoretical. In actual fact, the rising gap between household income and housing costs means that more and more households are financially vulnerable. Many must devote substantial proportions of their incomes to paying the rent (this proportion is now greater than 40% for one out of two Brussels households), resign themselves to cramped or substandard housing, or take money out of other basic spending categories, such as health and education (Commission Communautaire Commune de Bruxelles- Capitale, 2002; Béghin, 2006). Given such a context, the very possibility for many households of continuing to live in town has come into question. 2This crisis context is particularly noticeable in the neighbourhoods making up the historical heart of the city – the “pentagon” – or downtown Brussels and the neighbourhoods in the first ring around downtown Brussels that were urbanised mainly in the 19th century. The historical conditions that presided over the production of social areas in Brussels effectively produced a spatial organisation characterised by a concentration in downtown Brussels of old housing, often in disrepair and put on the private rental market (De Lannoy and Kesteloot, 1990; Billen and Duvosquel, 2000). Starting in the 19th century wealthier residents preferred residential areas outside the inner city, although they continued to work, shop, or have fun downtown. This centrifugal movement took on massive proportions starting in the 1950s, as middle-class families entered a period of social ascension that was followed by their exodus to the suburbs. The blue-collar groups resulting from international immigration that settled the central neighbourhoods in their stead were what saved the inner city from massive depopulation and abandonment. 3Today, close to three of four inner city households are tenants of privately rented housing, which makes up 54% of the housing in Brussels’ nineteen boroughs or communes. What is more, the private rental segment of the housing market houses the largest proportion of Brussels’ low-income households. It thus serves as de facto social housing, obviously without there being any question of structural criteria for adjusting the rent to each tenant’s income. The supply of government low-income housing – the de jure subsidised housing market – is cruelly lacking, for it makes up scarcely 10% of the housing in the Brussels-Capital Region: To be precise, 8% is social housing and 2% housing owned by a borough or welfare office. To make matters worse, this proportion, which is already very low in comparison with most major European towns, is falling steadily, for the volume of new subsidised housing construction is not keeping pace with that of private rentals and public housing outside the subsidised rental sector. Low-income households’ access to housing in the inner city blue-collar neighbourhoods has thus become much more problematic over the past decade. It is important to keep this in mind when one wishes to examine the currently clearly visible signs of re-investment in some of these neighbourhoods. However, this is not due to a halt in the middle class’s tendency to opt for suburbia. Moreover, while it is true that the Brussels- Capital Region’s population has been rising since the mid-1990s (up 7% between 1995 and 20061), after several decades of steady decline, this reversal, which is still recent and of limited magnitude, is not at all explained by a reversal in the migratory flows between the city and its outskirts. On the contrary, the net migratory flows continue to be negative for the Region, which loses some 10 000 residents a year to Walloon and Flemish Brabant Provinces2. Rather, the rise in the region’s population is explained by a higher birth than death rate in the population (in 2005, there was a positive balance of 5 800 people) and, above all, by a very positive foreign migratory balance* (some 16 000 new residents come to the Brussels Region from abroad each year). These figures, moreover, illustrate well Brussels’ increasingly cosmopolitan nature (Corijn and De Lannoy, 2000)3. 4If there is a return to the city, it does not mean (for the time being) that the model of the downtown post-modern loft has unseated aspirations for a freestanding home in a green outlying district as the “ideal” culmination of residential success. Rather, various types of protagonist sharing specific features of socio-economic ease appear to have “rediscovered” the inner city’s working-class neighbourhoods. They include, inter alia, real estate investors who are banking on the redevelopment of central areas for residential use by a (very) wealthy clientele, as well as, more broadly, young and for the most part educated households that are attracted by the characteristics that are specific to the centrally-located old neighbourhoods of a large city, i.e., social and cultural diversity, a dense network of urban activities, and so on. In addition, the public authorities have shown renewed interest in Brussels’ central neighbourhoods via a political project to revitalise these areas that was launched in the early 1990s. 5Studies conducted on a wide variety of cities around the world indicate that these reinvestment processes can be interpreted as examples of urban gentrification* (van Weesep and Musterd, 1991; Bidou-Zachariasen et al., 2003; Atkinson and Bridge, 2005). Of course, the gentrification trends described in specialised volumes can vary noticeably, especially when it comes to the rate of the neighbourhood’s transformation, types of forces involved, and types of transitions occurring (towards housing, business, tourism, etc.). This variety reflects the diversity of the urban contexts in which gentrification occurs. For example, the degree of government control over the real estate market, public and private institutional investors’ attitudes, and even dominant groups’ enhanced or diminished historical interest in the downtown area vary considerably from town to town. These aspects are so many parameters that affect the local forms of gentrification. 4 See: Alisch and zum Felde, 1992; Atkinson, 2000. 6However, beyond the locally variable modalities of gentrification, the notion itself remains highly relevant when one turns to underlining what the observed reinvestment patterns have in common. So, the notion of gentrification must be understood to be the sum of various developments whereby working-class areas are (re-)appropriated by groups that are socio-economically more advantaged than their prior residents or users. These developments cannot be separated from the pressure that is exerted on the existing social fabric, whether this pressure is exerted directly and suddenly (eviction of tenants due to reassessment of a neighbourhood’s real estate values) or more subtly (for example, in the wake of locally negotiated changes in the standards for using public areas or a change in the political priorities for a neighbourhood4). In other words, gentrification entails the simultaneous reappropriation (for some) and alienation (for others) of urban areas on the scale of the neighbourhood. In the English-speaking world, this is summarised by the expression “the class remaking of the inner-city” (Ley, 1996), an expression that underlines well the social issues that are inherent in gentrification’s advance. 7In the remaining pages of this article I shall focus on analysing the nature of the gentrification processes that are currently underway in Brussels. If the analysis is to be valid, one cannot simply transpose the descriptive or interpretative models set up in New York, London, or Paris to Brussels. It is thus necessary first to replace the recent developments in Brussels’ inner city neighbourhoods in their specific contexts. Then one can continue analysing the gentrification dynamics currently underway in Brussels through a study of migratory statistics seen from a very specific angle, that of the following question: Who is emigrating from the Brussels neighbourhoods that are being gentrified, and where are they going (in Brussels or elsewhere in Belgium)? 8When it comes to specifying the nature of the gentrification going on in a given urban setting, i.e., Brussels, the following analysis relies on a selection of gentrification indicators commonly used in the international literature and for which statistical information in Brussels is available5. What is more, analysis of the city as a whole was preferred, although information provided by finer analyses that are necessarily limited to smaller units (one or more neighbourhoods) will enrich our findings from time to time. 7 This is the income for 1993, as gleaned from the tax declarations filed in 1994. 9The change in the mean household income is a first indicator of a change in a neighbourhood’s social make-up. Table 1 gives the computed changes in this indicator for ten groups of statistical areas6* over 1993‑20017. These groups were constructed by breaking down the distribution of statistical areas into deciles according to the mean incomes of the households residing there in 1993. In other words, the first decile covers the statistical areas that were the poorest 10% in Brussels in 1993, whereas the last decile groups the richest 10% in 1993. Choosing the early 1990s as the starting point for the analysis is not without interest in the Brussels context, since this date coincides roughly with the institutional birth of the Brussels-Capital Region (1989), the first Regional Development Plan (which was adopted in 1995), and the launch of various urban revitalisation plans (the first Neighbourhood Contracts were launched in 1993). Federal Department of Economics – Directorate-General for Statistics and Information, 1991 Census, 2001 Socio-economic Survey, financial statistics, and the author’s computations. 10This first analysis reveals a fundamental trend, namely, the city’s increasing social polarisation, as attested by the widening income gaps between the first deciles (1‑3) and the upper echelons of the distribution (see the first two columns in Table 1). In other words, the inner-city working-class neighbourhoods have become more impoverished (at least in relative terms) over this period, whereas the already well-off neighbourhoods, especially those in the eastern part of the city, seem to have become increasingly gentrified (see also Van Hamme, 2003). This increased gentrification is achieved notably in the rising numbers of (very) well-off households involved in the city’s international functions, whether European or other positions (Cailliez, 2004). 11This first finding immediately rules out the hypothesis of a break in the model of Brussels’ spatial social structuring, whereby the inner-city workingclass neighbourhoods would henceforward head the list of residential areas preferred by wealthy households. For example, real estate investors developing luxury housing outside the traditionally gentrified areas of the city are (still) rare (Vandermotten, 2000)8. 12Should we deduce from this that gentrification is as yet a development with limited magnitude in Brussels (see, for example, Gatz et al., 2005)? 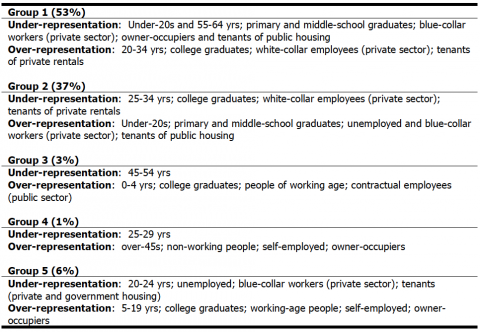 A completely different image is produced, however, as soon as additional indicators of social transition are taken into consideration (see columns 3 through 8 of Table 1). First of all, the rise in the proportion of graduates of higher education, which is marked in the region as a whole, is even more pronounced in the first deciles of the distribution (deciles 1 through 4). This rise in the level of instruction is undeniably linked to the city’s generational composition, for, all other things being equal, the younger generations brandish more degrees than the older generations. It is thus accompanied by a clear rise in the number of young adults (25- to 34-year-olds) in the first deciles. On the other hand, the opposite trends in the white-collar workers and blue-collar workers categories9 seen for the region as a whole, and which are signs of the increasingly service-oriented nature of the city, are strongest in the first deciles (1 through 4). Social change thus appears to be more marked in the working-class inner-city neighbourhoods, whereas the wealthier areas appear more stable. The change in the percentage of homeowners, for its part, is clearly above the regional mean only for deciles 6 and 9. The sectors included in the first deciles of the distribution thus remain primarily neighbourhoods of rented housing. Finally, the larger proportion of people having moved to other accommodations between 1996 and 2001 in the first deciles is an indication of the great residential mobility in these areas. This last finding supports the idea that the observed changes are not occurring through transformations of structures on site alone (for example, blue-collar workers becoming white-collar workers between 1991 and 2001), but that contrasting migratory movements are playing a significant role therein (blue-collar workers are being replaced by white-collar workers, for example). 13To sum up, we see a clear rise in the proportions of college graduates, young adults, and white-collar workers; a marked drop in the proportion of blue-collar workers; and the continued predominance of rented housing in Brussels’ working-class innercity neighbourhoods (deciles 1 through 3) – all in a context of these neighbourhoods’ relative impoverishment compared with the rest of the city. 14This combination of trends rules out the possibility of interpreting the ongoing transformations in Brussels in terms of “conventional gentrification”, which would entail net rises in the number of owner-occupiers and the mean income levels in the inner-city neighbourhoods. In Brussels, such a pattern today appears to be limited to some points on the map, new pockets of prestige that are still sparse but already differ markedly from their immediate surroundings. Such pockets include the reconstruction of downtown areas by private real estate developers or through public-private partnerships (several projects around the old grain market square (place de la Vieille Halle aux Blés/ Oud Korenhuisplein), for example). There are also cases of gentrification through the gradual renovation of buildings. These are movements initiated by investments by a first group of newcomers that are then taken up and enhanced by more institutionalised investors. The transformation of the Saint Géry-Dansaert neighbourhood is a good example of this type of transition (Van Criekingen and Fleury, 2006). Finally, the surge in loft projects ‑ a market segment that has been taken over by luxury real estate promoters – is another example of “conventional gentrification” that affects the industrial neighbourhoods along the canal in particular. 15However, a different pattern seems to have taken a greater hold in Brussels’ downtown working-class neighbourhoods. Indeed, all of the changes described above can be interpreted as the settling-down of young adults who rent housing on the private market, hold a series of intermediate social positions (neither poor households, nor well-off families), and are usually college graduates (or are in the course of earning their degrees). This is a form of reinvestment in the inner city by groups that, to date, appear to be richer in terms of cultural capital (measured by having a sheepskin) than in terms of financial capital (measured by income) and join a social fabric that, moreover, is prey to intensified impoverishment. This interpretation is strengthened by the observation of a very clear increase in the number of households in the central neighbourhoods. So, the number of households in the “pentagon” rose 12% between 1991 and 2003, compared with a 6% increase for the region as a whole, although the population itself barely increased (up 0.4% compared with a 4% increase for the region). This contrast between the changes in the (official) numbers of inhabitants and households indicates a change in the inner city’s socio-demographic composition (increased presence of small households of young adults) and subtends a marked increased in the demand for housing in downtown Brussels. 16This type of change refers us to a series of major socio-demographic trends that are not specific to Brussels, especially the breaking-up of families and family reconfigurations in the entry phase of adulthood (see, for example, Corijn and Klijzing, 2001; Elchardus and Smits, 2005). The lengthening and increasing complexity of the transition to economic independence and founding a family in particular are likely to involve a far-reaching redefinition of young adults’ residential mobility patterns and housing market integration strategies. Xavier Leloup’s 2005 study of young adults (20 to 35 years old) who were newcomers to Ixelles/Elsene (between Place Flageyplein and Porte de Namur/Namenpoort) is particularly enlightening when it comes to the positions that these types of household take up in a working-class neighbourhood in the heart of the Brussels, for Leloup documents clearly the transitoriness of these young people’s move to the neighbourhood: “I’m very pleased with Ixelles, but one thing’s for sure, we don’t intend to spend our whole life here. It’s a transition, a pleasant transition,” Olivier told us, stressing that his life was a chain of transitions, since, “…in any event, people are now taking decisions later and later…” (p. 186, translated). The young adults whom Leloup interviewed expressed attachment to specific conditions of city life that they found in that particular part of Ixelles and more generally in downtown Brussels, for example, the accessibility of urban infrastructure, social and cultural diversity, and the density of places of leisure. 17All in all, today more than ever, many young adults appear to be opting for rented accommodation in a densely populated, central urban environment that is likely to open the doors to many different opportunities. However, we must guard from generalising this type of transition to all young adults. Rather, this transition is the preferential experience of middle- or upperclass young adults who have the necessary means (possibly through their parents) to live on their own in combination with completing lengthy studies, putting off family commitments, and testing non-family forms of life focused on the search for the conditions of individual fulfilment (Galland, 2004). 18What is more, the heightened gentrification of traditionally affluent neighbourhoods appears to be pushing these young adults, along with other types of “middle-class” households, to “rediscover” interstitial or workingclass neighbourhoods that would ordinarily enter little into their mental pictures of urban space. In other words, these neighbourhoods would appear to offer practical solutions for middle-class young adults in situations of familial and professional transition, and thus in a period of uncertainty. Should one consequently speak of the inner city’s rejuvenation rather than gentrification? Similarly, should we deduce therefrom the image of a gentle transformation of the city’s central neighbourhoods marked by working-class areas’ gradual mutation into “trendy” rather than “chic” new areas? Critical analysis of these questions requires that we explore the social tensions that contemporary transformations of inner cities entail. In this respect, choosing to continue or not to continue to use the term “gentrification” is of decisive importance, in my view. Indeed, speaking about “rejuvenation” evokes nothing more than a sociodemographic trend, whereas speaking about “gentrification” (or embourgeoisement in French) refers to the (re-)appropriation of an area by more advantaged social groups than the current residents. Rejuvenation, like the terms regeneration, renewal, and revitalisation, which are all commonly bandied about by politicians, institutions, and the media, are socially smooth and as such cannot but incite approval: Indeed, who could possibly be in favour of devitalising the city? The term gentrification, on the other hand, offers the advantage of not sweeping the social issue under the rug. 19Today’s literature is unanimous in showing that contemporary gentrification occurs much more through socially selective in- and out-migration than through the social ascension of the neighbourhoods’ original residents (see Bondi, 1999 for example). Bearing this in mind, our empirical analysis focused on the migratory patterns in the Brussels neighbourhoods that were showing signs of gentrification, with attention being paid to both the profiles of those emigrating from these neighbourhoods (“Who is leaving them?”) and their destinations (“Where are they going?”) The profiles of these neighbourhoods’ immigrants and the latter’s geographic origins are complementary aspects that will not be treated here. 20The analysis rests upon a prior selection of the Brussels neighbourhoods showing signs of gentrification. 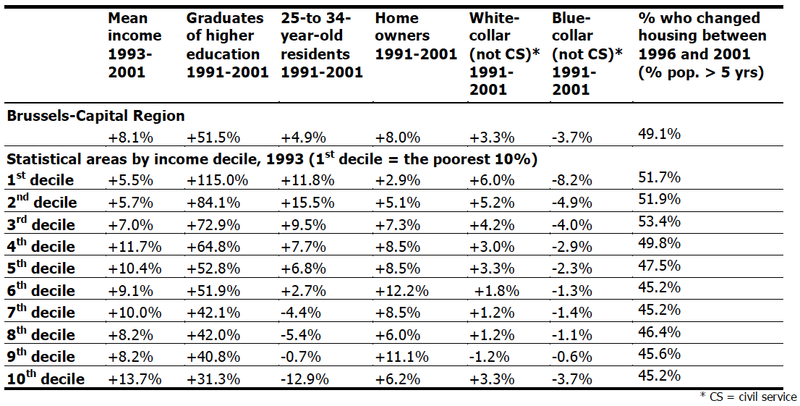 For this, we selected the statistical areas that showed a greater rise in the number of college graduates between 1991 and 2001 than for the region as whole whilst posting mean income levels per household below the regional mean at the start of the 1990s (relatively poor neighbourhoods, in other words). The idea was to construct an indicator that would signal a rise in the presence of middle-class households in working-class neighbourhoods. It was above all a (simplified) indicator of residential gentrification10. 11 It thus is not a sample. First, forty-two variables were extracted from the results of the 2001 socio-economic survey* in order to characterise the profile of each of the 16 000 migrants who had been selected. 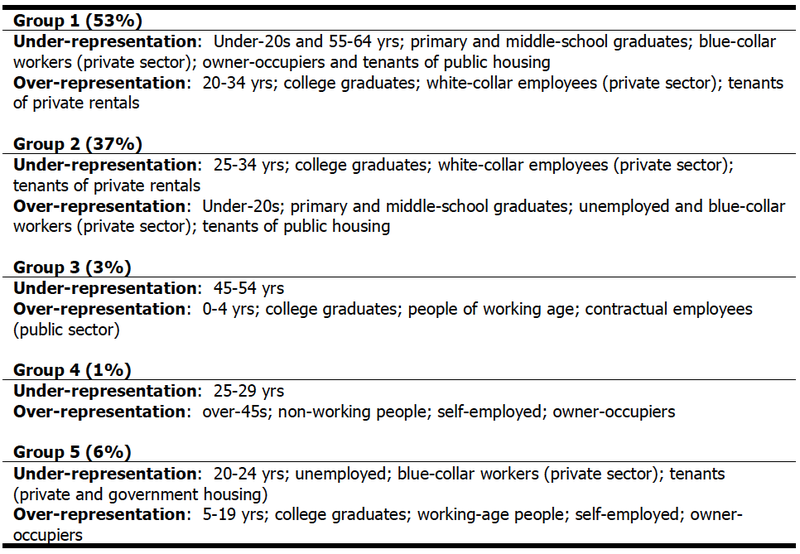 In a nutshell, this information concerned each person’s age, gender, level of instruction, position on the labour market (working, unemployed, not of working age), type of employment (white-collar employee, blue-collar worker, self-employed, company head), type of activity, and type of position on the housing market (owner or tenant). All of these variables then underwent multivariate analysis (principal component analysis). The purpose of this operation was to reduce the initial number of variables (42) to a smaller number of components whilst conserving the maximum amount of relevant information. The analysis produced 14 components that accounted for 72% of the total information or variance. The first component, for example, alone concentrated 15% of the information. 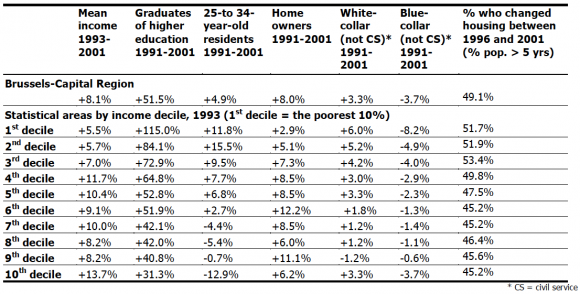 It differentiated the migrants’ host communes in 2002 along a socio-economic axis, i.e., those that took in a large number of blue-collar workers, unemployed people, and people with low levels of instruction and those that took in large numbers of white-collar workers, people in jobs, and graduates of higher education. Finally, a typological analysis of these fourteen new components was performed so as to regroup the destinations by similarities in the migrants’ profiles12. The final outcome was a five-category classification of the localities to which the migrants who had been registered a year earlier in gentrifying Brussels neighbourhoods moved in 2002. The following section focuses on deciphering the contents of these five groups so as to reveal the natures of the migratory flows that were analysed. 22Table 2 below presents the variables that characterised each of these groups most significantly, that is to say, the variables for which there were clear (positive or negative) differences between the profile of the migrants in one group and the profile of the entire corpus of migrants, without distinction as to their groups. Next, each group’s geographical distribution has been mapped in Figure 1. The percentages in brackets indicate the proportion of the entire group of migrants in each group. The under- and over-representations posted in the table were tested stastistically by a chi-squared test. Figure 1. Where are the emigrants from Brussels neighbourhoods undergoing gentrification going to? 23The results give some insights into the diversity of reasons subtending the migratory flows for a selection of inner-city neighbourhoods in a large city such as Brussels (migrants’ profiles and places of destination). The destinations of the migrants in the first group, which accounts for more than half of the migrants analysed, are the centrally located boroughs (or municipalities) of the country’s main cities, namely, Brussels (11 of the region’s 19 boroughs or municipalities), Ghent, Antwerp, and Liège, but not Charleroi. They also include smaller urban areas close to Brussels, such as Leuven. Young adults (20‑34 years) who are college graduates (or still students), renters on the private housing market, without children, and at the start of their careers predominate in the migrants moving to these localities. This series of characteristics suggests that a very large proportion of the people migrating out of the neighbourhoods that are becoming gentrified consists of college-educated young adults who are in the process of gradually setting up their conditions of occupational and family stability. They make up a particularly mobile group that has a clear tendency to prefer large urban centres because of the concentration of skilled service sector jobs that they offer and a housing supply in line with their needs. Their migrations can in this regard mean moving from a gentrifying area to another area subject to the same type of dynamics in Brussels or another large town. As such, they are primordial protagonists in the advance of the process of gentrification. 24The profiles and destinations of the migrants in the second group are very different from those described above for the first group. This time we see a high percentage of the migrants sharing a series of characteristics of socioeconomic fragility (less-educated populations, unemployed, blue-collar workers, tenants of public housing). Their destinations are located in the western part of the Brussels-Capital Region, in the axis of the Senne Valley near the region’s boundaries (Vilvoorde, Machelen, and Sint-Pieters-Leeuw), in certain small or medium-sized towns (Mechelen, Aalst, and Oostende), and in the towns located in Wallonia’s “industrial furrow” from Mons to La Louvière and Charleroi, or around Liège (notably Seraing). This suggests the existence of migrations of vulnerable populations heading towards municipalities that are marked to various degrees by conditions of economic backsliding. There is clearly a centrifugal force pushing socially weakened populations towards areas with more suitable conditions of access to housing (but not to jobs), i.e., in the western part of Brussels, in the industrial fringes of Brussels, or farther away, especially in Hainaut Province. Of course, the information processed here and the methodology used do not allow one to set a precise figure to the number of people whose migrations followed direct eviction from their neighbourhoods, for example following too great a rise in housing costs. Additional research based on qualitative surveys (and thus necessarily limited to a sample of people and restricted area) is necessary to know this. This methodological reservation aside, the results of the typological analysis nevertheless give a very likely plot of the contours of a geography of migration that is more forced than voluntary and made by socially weakened households living in inner-city areas affected by gentrification. 25This finding clearly echoes the conclusions of analyses conducted in other cities (such as London: Lyons, 1996) and which clearly revealed a marked tendency of low-income households leaving areas undergoing gentrification to resettle in neighbourhoods close to the place that they left but subject to less real estate pressure. In Brussels, earlier investigations have already documented migrations of socially weakened groups from the eastern part of downtown Brussels to its more workingclass western neighbourhoods (De Lannoy and De Corte, 1994; Van Criekingen, 2002). 26Our analysis also shows that this type of migratory pattern also involves movements over longer distances, in this case from downtown Brussels to municipalities that have been hit heavily by the economic crisis, especially in Hainaut Province. There is little doubt that more forced than voluntary movements, especially linked to the growing pressure of housing costs in Brussels, make up a significant proportion of these longer-distance migrations. In this respect it is significant to find the municipality of Ronse/Renaix placed by the typological analysis in this same Group 2, to the extent that an influx of Moroccan households from Brussels, attracted largely by the real estate price differential, was revealed elsewhere (see the Flemish daily De Morgen, 21 August 2006). Our findings suggest that Renaix definitely is not the only municipality to take in households of various nationalities with limited incomes and who have been excluded from the Brussels housing market. 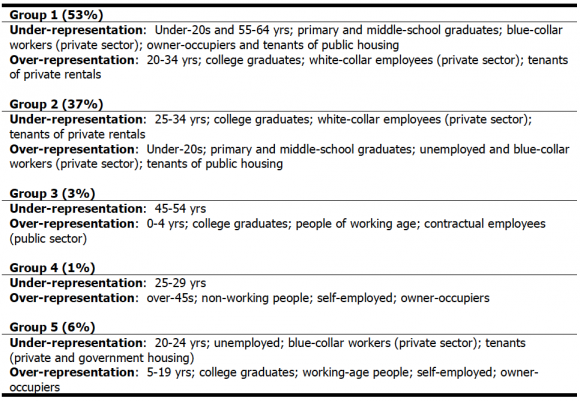 13 Statistically founded distinction based on the migrants’ modal age differential and job types. 27The three remaining groups, which are much smaller than the first two, complete the picture of the diversity of reasons subtending the waves of out-migration from the Brussels neighbourhoods that were selected for this study. First of all, Groups 3 and 5 illustrate suburbanisation processes that are well documented elsewhere (De Lannoy and Kesteloot, 1990; Mérenne et al., 1997, for example). These processes are typically fuelled by middleclass families’ moving to suburban municipalities. If we consider the details, the distinction between Groups 3 and 513 suggests the existence of some “sorting mechanism” amongst the households leaving the city, with one pattern consisting of affluent households having access to the most soughtafter suburbs (Group 3) and the other consisting of centrifugal migrations of younger or less wealthy households towards the localities that are located farther from the urban centre. This result supports the commentaries that stress the inaccessibility of certain close suburban areas to newly formed young households, thereby driving forward a suburbanisation front even farther from the city. Finally, the characteristics of the migrants in Group 4 indicate a standard trajectory of older households towards non-urban areas, especially seaside localities. This clearly points to migratory flows of old-age pensioners towards resort areas. 28Analysis of urban gentrification processes cannot be dissociated from the attention that is turned to the social issue that this type of pattern triggers. In this connection, our analysis concludes that even though gentrification in Brussels (still) often bears the features of a “slow” transformation of the city’s central neighbourhoods, spawning new areas that are “trendy” rather than “chic”, this trend is (already) highly socially selective nonetheless. Of all the population movements that this analysis has revealed, a centrifugal out-migration of vulnerable populations originating from neighbourhoods in Brussels that are undergoing gentrification cannot go unnoticed. This type of movement is moreover specific to the emigrants from the neighbourhoods that are becoming gentrified compared with emigrants from the city’s other neighbourhoods. Indeed, there are proportionately more emigrants from the selected “gentrifying” neighbourhoods than from the other neighbourhoods of Brussels in the newcomers to the destinations combined in Group 2 of the typology14. In other words, whilst it is true that the Brussels neighbourhoods that were selected in this article on the basis of a gentrification index are not the only ones that are losing residents who are in or approaching financial straits, it is no less true that this type of out-migration is more marked for this group of neighbourhoods than for the others. 29This finding reminds us of the crucial matter of government control over the forces of gentrification. Of course, the public authorities in Brussels cannot control all the levers of the economy’s globalisation, contemporary changes in the start of adult life, even the city’s internationalisation, which are all phenomena with great bearing on the spread of gentrification in Brussels (as in other cities). Nevertheless, the type of response that is made in terms of local urban policies to deal with gentrification is not predetermined. In this connection, the Brussels authorities have raised the theme of “revitalising the inner city” to the rank of an essential saying in urban policy, especially since the Brussels-Capital Region’s creation in 1989. The use of this vocabulary, along with such terms as “urban renaissance” or “urban rebirth”, bolsters the commonly accepted idea of an “urban decline”, the causes of which are attributed to the middle class’s “exodus” to the suburbs (“urban flight”) and the concentration of low-income households, often of foreign extraction, in the city’s central areas. The assessment that prevails in the Regional Development Plan (2002) is very clear on this and indicates, for example, “(that) the first ring in the western part [of the city]… suffers from a general lack of both economic and residential attractiveness…” (p. 6). This excerpt attests to an at-the-very-least singular view of working-class neighbourhoods that are amongst the most densely populated areas in the city, bustling with social and economic activity, and culturally cosmopolitan. This statement should rather be interpreted as saying that the number of middle-class, Belgian, family households in the centre of town is limited. Attracting this type of household, whose members are both taxpayers and voters, to the inner city is a political priority in Brussels. This is commonly legitimised by referring to values such as social mixing and cohesion, sustainable development, the need to enhance the city’s image, and conservation of the built heritage. To this end, various measures have been implemented since the early 1990s to get private players to (re-) invest in the inner neighbourhoods. These include housing renovation subsidies, the rehabilitation of streets and sidewalks, public space beautification and surveillance, and so on. 30Seen from this angle, the revitalisation policies being waged in Brussels diverge little from the urban policy options that have been preferred in most Western cities over the last two decades (Smith, 2002). It is obvious, of course, that the ways that the urban policies try to contain or channel gentrification processes vary from city to city. For example, measures designed to make people feel safe in public areas are pushed much more strongly in New York than in Brussels. Nevertheless, diverging forms and implementation conditions cannot hide the common propensity to consider getting the middle-class to come back to the city to be a solution for the many urban policy issues that need to be addressed, such as restoring the municipality’s tax base, preserving the city’s built heritage, and “managing” marginalised groups. 31On the other hand, gentrification is much more seldom perceived to be a problem leading, in actual practice, to increased spatial segregation of social groups, even to vulnerable groups’ eviction from the city. This tendency of urban policy-makers to consider gentrification a solution rather than a problem is all the more meaningful in cities such as Brussels, where public authorities have little control over real estate market mechanisms (see Bernard, 2006, and Le Soir, 23 August 2006b). In such cases, there is little to prevent the use of terms such as “revitalisation”, “regeneration”, and “renaissance” in public discourse from being translated by geographically consolidated increased social segregation through highly socially selective in and out-migration movements. HENAU, A. (2002) La démographie récente de la Région de Bruxelles-Capitale, Indicateurs Statistiques Bruxellois, No. 38, Ministry of the Brussels- Capital Region. The difference between the number of people moving into or out of a given territory (immigration and emigration or “in-migration” and “out-migration”). A positive balance corresponds to a larger number of arrivals than departures. In statistics, a tenth (10%) of the number of individuals being considered. As the corpus is ranked in increasing order, the 1st decile corresponds to the lowest values and the 10th decile to the highest values. A vast, detailed survey of all the residents of Belgium who were in the country’s municipal population registers on 1st October 2001 that was conducted by the National Institute of Statistics (Federal Department of the Economy). Arrival in working-class neighbourhoods of middle- or upper-class people who transform or renovate the existing buildings. The resulting price increases lead to the gradual departure of the initial residents. The division of the territory into districts for censuses or surveys. For Belgium this division is established by the National Institute of Statistics (INS/NIS). 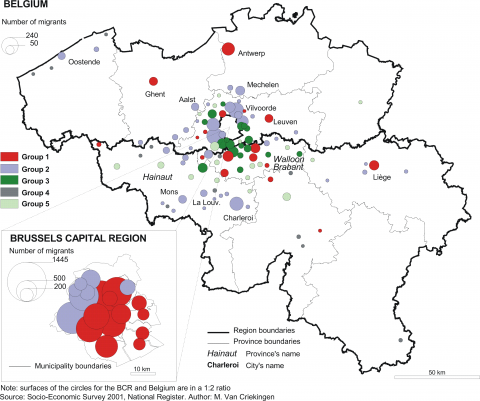 The Brussels-Capital Region consists of 722 statistical areas. 1 This trend refers to official residents only. It does not include several tends of thousands of people residing in the city without being on its official registers (Henau, 2002). 2 Curiously, Brussels’ regional government asserted in its 2002 Regional Development Plan that the urban exodus from Brussels ended in the mid-1990s (p. 6) and there appeared to be a very really tendency to return to the city (p. 8). 3 Brussels’ positive migratory balance with the rest of the world can be broken down roughly as follows: one-third of the migrants come from “rich” countries (the EU, North America, Japan, and Australia) and two-thirds from “poor” countries (Africa, Asia, Latin America, and Eastern Europe). 5 It is not possible, for example, to map an indicator of rent trends for the entire city of Brussels on a fine scale. 6 This is the finest level of statistical data aggregation available in Belgium. The Brussels-Capital Region is split into slightly more than 700 statistical areas, of which 606 contained more than fifty households in 1993 and 2001. All of the values presented here were computed from these 606 statistical areas. 8 Nevertheless, a seminar of real estate professionals and regional authorities was held recently to examine the conditions under which the promotion of housing in Brussels could become a “new Eldorado” in the near future (Editions et Séminaires s.a., seminar of 26 October 2005). 9 These are private sector workers only. The classification of their public sector counterparts changed between 1991 and 2001, making a comparison of the two groups in civil service impossible. 10 The main aim of this article effectively does not call for a more sophisticated combination of indicators that could allow more finely for the incontestable diversity of forms of gentrification in Brussels. 12 Cluster analysis (ascending hierarchical classification - Ward’s criterion). For a more complete description of all the methods used, see Van Criekingen (2006). 14 This specificity also applies to the migrants in Group 1 of the typology (especially the college educated young adults, who are more agents than victims of gentrification), unlike the migrants in Groups 3, 4, and 5.